Home / Lifestyle/ STHRI by Selyn and Island Lush collaborate! STHRI by Selyn and Island Lush collaborate! Creating fun and vibrant sliders – ethical footwear! Looking for a summer sandal you can wear with everything? Look no further than the brand new collaboration launched by STHRI by Selyn and Island Lush. These fantastic pieces use production off-cuts of the vibrant cotton handloom fabrics woven by Selyn and are lovingly handmade by designer footwear label Island Lush. If your heart is set on more fashion-forward sliders, Island Lush has figured out a way to mould a sandal that is slender and easy to wear. The collection is filled with punchy colours that are an ideal match for any outfit. STHRI is proudly built on Selyn’s 25 years of strong Fair Trade roots and is an ethical fashion collective featuring a range of everyday wear, curating collaborations with like-minded fashion designers and social brands. Combining fashion and social movement, STHRI brings to you empowered fashion for women by women. 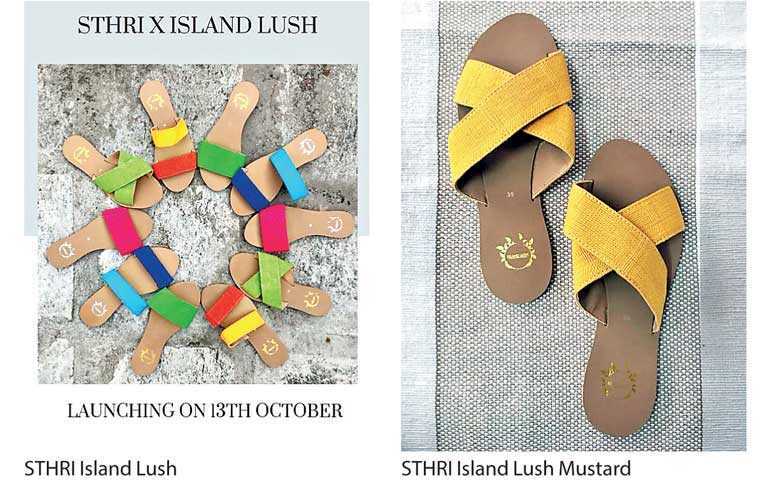 Island Lush, a name that resonates with its origins of being a truly tropical and exotic brand, has captured hearts and ‘soles’ of many island lovers as a fast emerging designer footwear label in Sri Lanka. Launched in 2015, Island Lush is the brainchild of Irushi Ratnaweera Perera. Having a range of intricately designed handmade footwear of many vibrant textures and materials that have touched the island spirit of both locals and tourists. This collaboration is a joining of hands between like-minded women entrepreneurs of Sri Lanka that believe in ethical and empowered fashion. Available now at Selyn Flagship store at 102 Fife Road Colombo 05 and soon online at www.islandlush.lk.